In a few weeks from now, seasonal forecast for the Indian summer monsoon will be announced. Among various parameters that determine the fate of the monsoon is the sea surface temperature, more specifically, the contrast between land and sea temperatures. But what are the parameters that determine sea surface temperatures? While much attention is paid to the air-sea interaction and ocean dynamic processes that determine these temperatures, what remains largely underappreciated is the role of ‘clouds’ in the ocean that can block the amount of sunlight penetrating below the surface and thus play a significant role in determining the sea surface temperatures. These ‘clouds’ are actually photosynthesising algae, phytoplankton. Phytoplankton responds much faster to processes that alter temperature than the temperature itself, which changes slowly due to water’s high heat capacity. This means that the phytoplankton are often early indicators of an impending change in temperature and can offer a potential to extend the lead time of climate predictions such as that of El Niño as well as the Indian monsoon. As early as the 1960s, it became clear that the microscopic algae photosynthesize and serve as the bottom of the invaluable food chain and that they can affect the depth of penetration of solar radiation into the ocean and influence ocean temperatures. 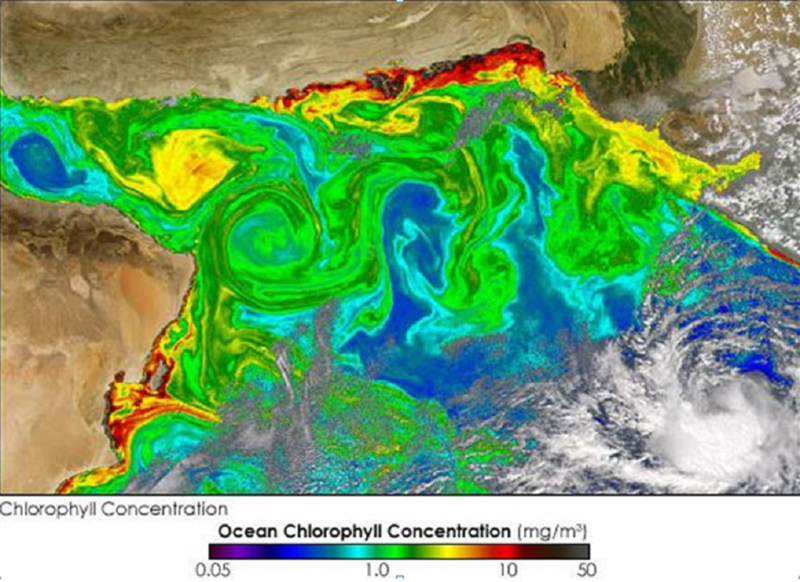 Satellite chlorophyll data were used in the 1990s to argue that the strong coastal upwelling off Somalia during the Indian monsoon season may have asignificant influence on the ocean-atmosphere interactions. A study led by me in 2002, using an ocean model and satellite chlorophyll data, showed that the impact of chlorophyll in the critical eastern equatorial Pacific can be important enough to control the amplitude and frequency of El Niño and La Niña events. A series of studies by the University of Maryland- NASA group and several other groups have used ocean-atmosphere coupled climate models to explore shading effect of the phytoplankton. The depth to which solar radiation can penetrate affects the heating rate of the upper ocean down to a 100 metre or more and this influences the warming of the sea surface which in turn alters the atmospheric winds, humidity and clouds and thus El Niño, La Niña and the monsoon. One of our studies employed satellite data for chlorophyll, surface temperatures, sea level and outgoing longwave radiation (OLR).OLR is an indicator of rainfall – heavy clouds reduce OLR and high OLR means shallow, non-rainy clouds or clear skies. We showed that during the demise of the strong 1997-98 El Niño, the surface chlorophyll was able to respond to changes in the ocean temperatures below the surface by February of 1998. This was astonishing because the surface temperatures did not cool down till May of 1998. Phytoplanktons respond rapidly to subsurface temperature changes since these changes are typically associated with changes in nutrient concentration. On the other hand, the heat capacity of the ocean is high and the surface temperatures of oceans change much more slowly. This has implications for predicting the end of El Niño. Our study focused on the decay phase of the El Niño due to the dramatic changes seen in the satellite chlorophyll data. Now a new study from NOAA’s Geophysical Fluid Dynamics Laboratory in Princeton published recently in Geophysical Research Letters says that surface chlorophyll responds much before the sea surface temperature during the evolution of El Niño’s as well. This group has used an Earth System model which includes the ocean-land-atmosphere-nutrients-phytoplankton and the interactions between them. Based on this insight, this study has suggestedthat a new index for El Niño can be developed with phytoplankton as an early indication of the potential arrival as well as the demise of an El Niño.